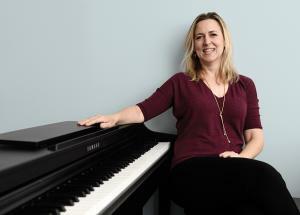 Professor and pianist Susan Boettger launches Lyceum Village, a unique after-school program in Tustin for children in grades K through 8. What is the idea behind Lyceum Village? I have three girls ages 11, 9, and 6. My husband and I wanted them to be well rounded but we also value family time. Driving around to different activities was frustrating, and we always had to choose between something like honors orchestra and basketball because these things always conflicted. So I wanted to have a facility where all of these programs were in one location and then we could come home and enjoy dinner as a family. I was tired of being a drill sergeant. I’d rather be a cheerleader mom. It’s a three-block schedule, four hours after school. Younger grades might do one language, one sport (such as basketball, volleyball, or martial arts), and one instrument. Older grades have a longer block dedicated to homework. We help parents choose a schedule and choose the courses their kids will take. They can do two, three, or five days a week. We also have summer and winter camps. I’m a music teacher, and I found a lot of quality private instructors in the area that were having trouble finding a place to teach. And the great thing is, since this is an after-school program, the fees ($499 a month for two days a week, $699 for three days a week, and $899 for five days a week) are all tax deductible. I went to Rice University where I studied music and piano and mathematics. Then I pursued piano at Julliard School in New York and I went to USC for my doctorate in piano. I taught math for four years at Costa Mesa High School and piano at OCSA. Now I’m a full-time professor at Irvine Valley College and director of the Junior Chamber Music program, a non-profit. What do you envision for the future of Lyceum Village? We’re already looking to open our second and third locations. We’d like to see one of these programs in every major city that has a high-density population similar to this area, which is the border of Tustin and Irvine. There’s obviously a need for this type of program. There’s nothing worse than coming home after a hard day and your kid hasn’t done their homework or practiced their instrument and has a project due tomorrow. And that is a solvable problem. Check It Out! Find out more at lyceumvillage.com. Previous articleWhat’s the Dill With Pickle Juice in a Cocktail?